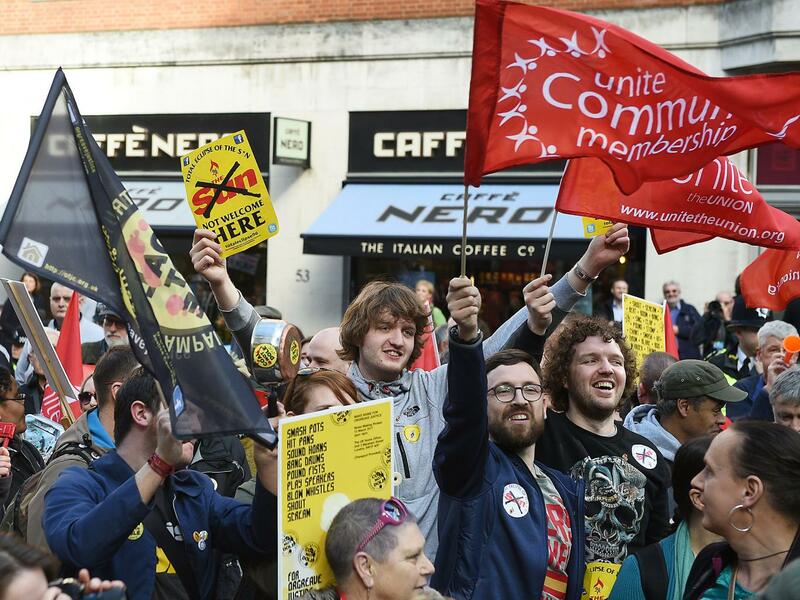 Protesters gathered outside the Home Office during the Orgreave demonstration in London last year [Image: EPA]. Tomorrow marks a year since the Government’s decision to deny the request of the Orgreave Truth and Justice Campaign for an inquiry into the events of the 1984 “Battle of Orgreave”. This was a historic betrayal of the cause of justice, making clear that, in the eyes of this Government, justice is not universal, blind and timeless, but partial, political and time-limited. The full picture of what happened at Orgreave 33 years ago and its aftermath remains unclear, hidden by the passage of time and by a concerted effort to conceal the truth. Yet the violence of the police operation remains as shocking today as it was then. The images of mounted police, batons drawn, charging into the crowd and armoured, shield-wielding police officers beating men lying prone remain seared on the collective memory of coalfield communities. All 15 of the pickets who would eventually stand trial, charged over the events at Orgreave, alleged that they had been the victims of serious assaults by police officers. Several had serious injuries and broken bones. The trial of those men later collapsed following clear evidence of witness tampering, altered and dictated statements and an apparently organised attempt to secure convictions for riot. Yet the collapse of the trial did not challenge the narrative already established by the police. The cause of justice is too important to sacrifice for political expediency. It may indeed be uncomfortable for the Government to challenge what many on the right of the Conservative Party have long held to be a sacred cow. But we deserve to know, fully and authoritatively, what happened 33 years ago in my constituency. The miners, their families and coalfield communities deserve the truth. The Establishment will always look after its own. There will be no justice while the perpetrators still live and can be brought to book. I saw the Enemy Within play at Brighton Lab Confernce Momentum Fringe. I know how vicious the police can be. totally unfair and know as a girl and from working class background there is no justice,no law just brutality and support of abuse and collusion of females, children, working class, gays and diversity. Still the violence and disgusting treatment of honest decent working class folk and miners families fill me with disgust. Never let it be said we live in a civilised society with rights or humanity. Brute Beasts with no conscience. I do not believe in justice. I think that at right time when all concerned and liable are too old or dead we will get an agreed statement of justice and unfairness by some pre directed set up judge. To satiate the masses, to please the plebs. I have no confidence. But I am sure some set time in the future they willplay their little theatre to quieten us. Just in case anyone forgets. This is the relationship of the British Govt to the British People and what they really believe and contempt on them. STOP GIVING THEM YOUR MONEY, STOP GIVING THEM YOUR VOTE. and that means the bastards in Labour as well. Who stay silent, collude, believe miners, working class people and North are nothing and said they did not want us but still take our money in Union subs and lifelong accumulated pensions, Dont you ever think they have changed or think different because of Jeremy and John and a few. They are just in it for themselves and what they can get out of it. Your claims about Labour are inaccurate – unless you can produce hard evidence to the contrary. Or are you attacking an entire party of more than 600,000 people, based on the behaviour of a very small number of them?